Why roll your Oreo Truffles when you can press them on top of brownies?? 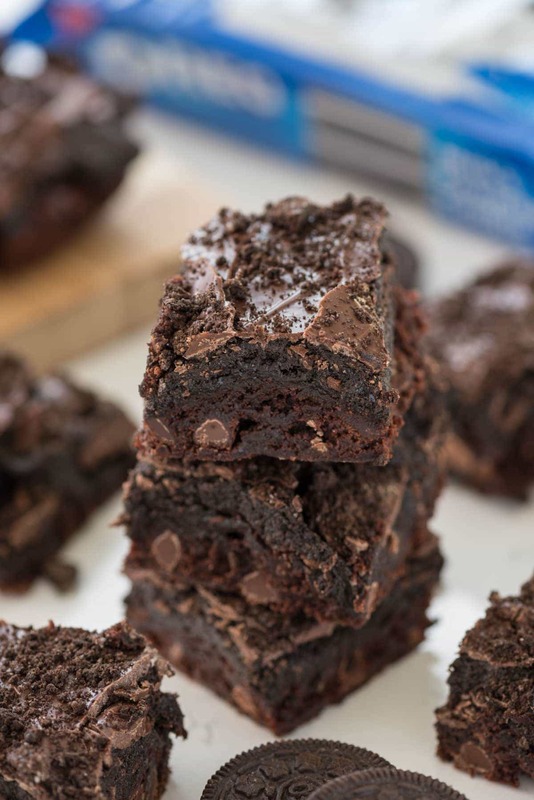 This is one of my favorite recipes: the original Oreo Truffle Brownies!! About a year ago, Jordan’s school had an evening book and craft fair. We went to dinner with some friends and then drove over to the school to buy some new books. As we walked through the parking lot, at 7:00 at night in the late Fall, the stars were coming out. I thought she was joking. Her friend and his mom laughed. And then I realized something. She was serious. She really didn’t know how dark it gets. Because she always goes to bed before 8:00. And, other than Halloween, we were hardly ever outside after dark. The poor child had been deprived of nighttime. I’m really not a horrible parent. I just value my sanity. You see, no matter what time she goes to bed, she wakes up no later than 6:30. Recently, we hit a long stretch of bouncing into my bedroom before six. And when she loses sleep it takes her days to recover it. Days, people. Days of tantrums and general unpleasantness. But this year I decided to be nice. We had people over for New Year’s Eve and let her stay up to celebrate the ball drop…with the East Coast live show at 9:00. And I may have let her think it was midnight. Maybe. But I will neither confirm nor deny that. As for the screaming and unpleasantness…for going to bed at 10:00 pm, she was pretty good until bedtime Sunday. There may have been a lot of TV on that day. And the next. But I will not confirm nor deny that either. I didn’t make Oreo Truffles this year. I wanted too, but ran out of time for all that rolling and dipping. And then I thought, why not just make an Oreo Truffle layer? On brownies? And spread melted chocolate on top? So. Much. Easier. I’ll be making these again for sure. As for letting Jordan see the night sky again…well, there’s always New Year’s Eve next year. Use any brand of brownie mix you want, as long as you make it in an 8×8 pan. A few brands have the smaller size option, or you can use my homemade brownie mix recipe and make it as directed for a 9×9 pan (but bake it in an 8×8). Use ANY flavor Oreo to change up the flavor! The crushed Oreos on top are optional, but pretty. Why roll Oreo Truffles when you can put them on top of brownies?? 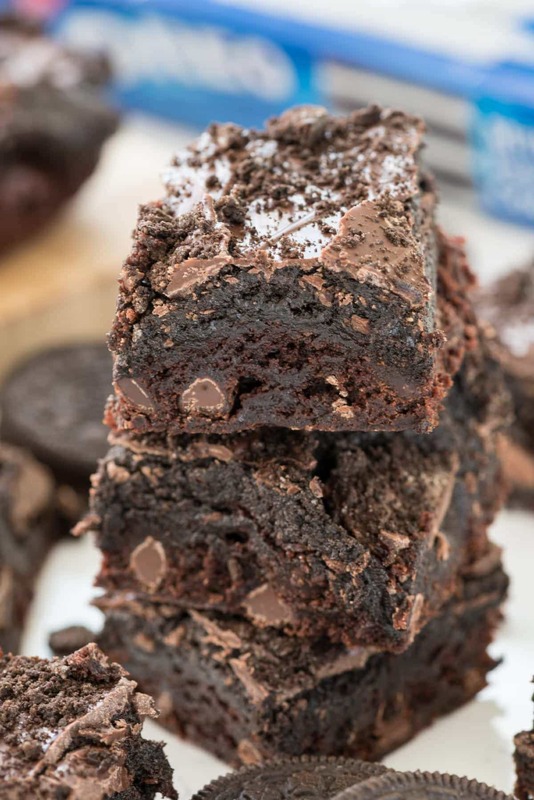 Use your favorite brownie mix or recipe and make Oreo Truffle Brownies!! They're so chocolatey and delish. Finely crush 20 Oreo cookies in a food processor. Add cream cheese to food processor and pulse until mixture is combined and smooth, scraping down the sides of the machine as needed. Spread over brownies and press to compact. Place remaining 3 Oreo cookies in a large resealable bag and roll with a rolling pin to crush. I just wanted to let you know that I just cut these brownies (and sampled one) and they are amazing! I changed the chocolate chips to ganache, but otherwise followed the recipe. 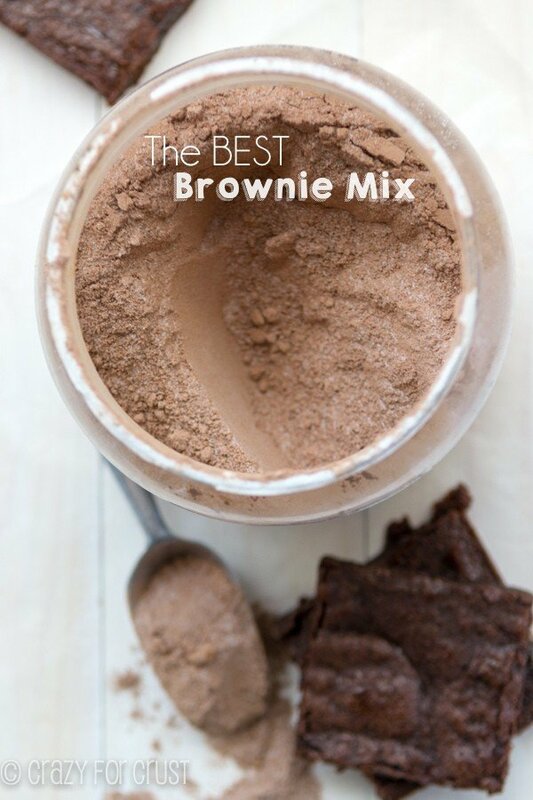 BEST BROWNIE EVER!And easy! I already pinned this, but I’m going back to edit and say how great they are. I wanted something to add to a buffet table for my girls Baptism. I already have vanilla cake and I made sugar cookies to give out as “favors”, but I needed something chocolate. Well this is it! Chocolate on top of chocolate on top of chocolate. Can’t go wrong. Thank you! Yay!!! Thank you so much for letting me know Annie. I’m glad you love them!! Made these today for my mom to take to work. I let the edges get a bit too hard (always forget JUST how much the brownies harden after removing from the oven – gotta take them out way before a toothpick comes out clean!!) But I think the moist truffle layer will make up for it. I just used the icing packet that came with the brownie mix instead of using chocolate chips and decorated the top with chopped Easter chocolate mini eggs candies!! I’d like to try making these again using peanut butter sandwich cookies, and also using vanilla sandwich cookies with strawberry cream cheese (I’ve done that for making the actual truffles before and people love it, so I can only imagine that adding a layer of brownies to that would be excellent!! I’m glad you liked them! Sorry they cooked too much. I always err on the side of underbaked with brownies! 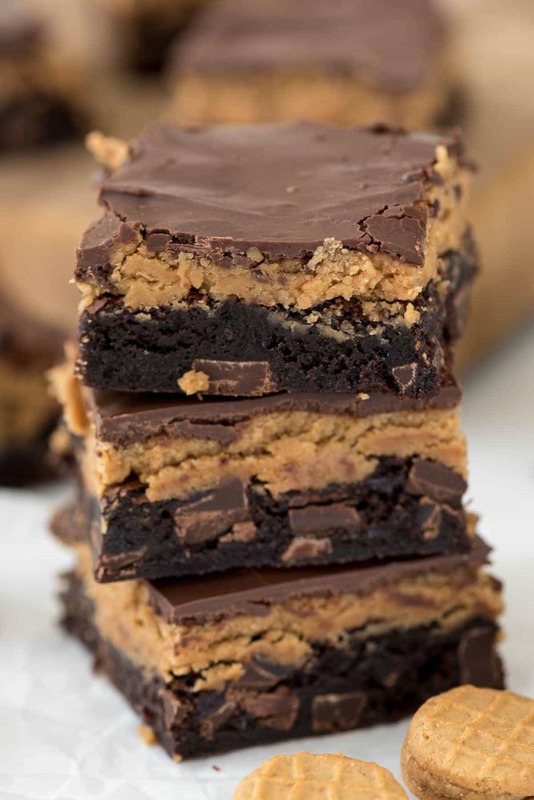 Apparently I got rave reviews and recipe requests for these, so I shared the recipe and told them to check out your blog for other dangerously good looking recipes!! Thanks for the AMAZING blog – The pictures and clean layout are quick ‘sellers’ for your recipes even before you realize how good the actual thing is! Ok, so I just made these again – this time using peanut butter sandwich cookies and peanut butter chips. Got good reviews again and a recipe request – I sent them the link to your blog!! YUM! LOVE it, thanks Nikki! Just made these with a King Sized Hershey bar in the brownie layer (a steal from your recent cookie truffle post), semi-sweet chocolate chips on top of the brownies, and chocolate cream Oreos. If lightening strikes me today, I’ll die a happy gal thanks to this recipe. Fantastic!!! I’m so glad you enjoy them Stacey! Hi! Can you taste the cream cheese in these? Or does it just add to it’s fudgy, brownie taste? Thanks! Do they need to stay refrigerated? Not sure if the cream cheese is safe to stay out?